Striking workers at the Lonmin mine in South Africa are returning to work after agreeing a 22% pay deal, following weeks of industrial action. However protests continue at other mines in the country. South African police have fired tear gas and rubber bullets today to disperse protesters near a mine run by platinum producer, Amplats. It's the first sign of unrest spreading after strikers at smaller rival mine, Lonmin won big pay rises. A police spokesman said, "We are not tolerating any illegal activity." Within hours of Lonmin agreeing to a pay increase of 11 to 22%, workers at neighbouring mines were calling for similar hikes, suggesting more trouble is to come after six weeks of industrial action that has claimed 45 lives and threatened Africa's biggest economy. 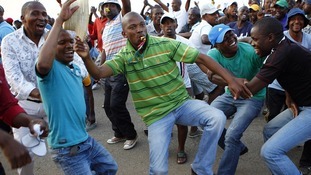 Amplats had to suspend its Rustenburg operations last week because of the unrest. Those mines restarted on Tuesday but the company admitted many workers had stayed away.